Bathing is one of the quintessential home experiences, one that has been around for as long as there have been people. In the ancient polities of India, Greece, and Rome, bathing occupied a prominent role in people’s daily lives, with communities even developing elaborate rituals and building magnificent structures as an homage to the communal variety of the bathing experience. Today, bathing is largely done in the comfort of our own homes, but that doesn’t mean its importance in our daily lives has been diminished. Aside from allowing us to physically clean ourselves of everyday dirt and grime, bathing is also one of the simplest things we can do at home to help ourselves relax and rejuvenate for the next day. This is why it is important to make sure that we have as pleasant a bathing experience as possible every time we step into our baths. In this article, we’ll fill you in on some of the best ways to improve upon this important daily ritual of ours. One of the quickest ways to imbue your bathroom with a spa-like character is by introducing a water fountain in your bath area. The sound of flowing water is guaranteed to help you feel relaxed as you wash your daily cares away, while the fountain itself is a pleasant decorative addition to your bathroom. If your bathroom features a modern, minimalist design, consider a beautiful bamboo tabletop fountain that will bring out the zen in your bath area. If limited space is a concern, consider mounting a wall fountain instead. A rain shower head is basically a shower head that goes directly above the head. It’s usually round or square in shape, and wide in diameter or width, possessing many small holes that deliver water gently over the user’s head. This should give you the sensation of bathing under a rain shower, creating a sumptuous, spa-like bathing experience. If you’re concerned about the water pressure not being strong enough to make you feel squeaky clean, make sure to buy a shower head model that accommodates stronger water pressures. As most spa professionals will tell you, lighting a few scented candles in your bath is another easy way to elevate your bathing experience. It not only turns the atmosphere in your bath into something more conducive to relaxation, it can also provide aromatherapeutic benefits if you choose candles that contain stress-reducing essential oils like chamomile, lavender, sandalwood, and eucalyptus. Consider buying organic candles made from beeswax and soy wax if you want more sustainable options. When using candles, make sure to keep them away from flammable materials like towels and bathrobes. To keep things safer, consider placing them inside candle holders. Time and again, various studies have shown that indoor plants are beneficial for your health. Not only do they help provide oxygen in living spaces, they are also good for people’s physiological and psychological health, helping lower the levels stress hormones and reducing blood pressure at the same time. This is why it’s a good idea to consider introducing a bit of greenery in your bathroom. Plants like aloe vera, dracaena, and variants of orchids, ferns, and bamboo are great in low-light, high-humidity environments like bath areas. Also consider placing rose petals in your bathtub once in a while to give you that full Bali or Hawaii experience in the comfort of your own home. 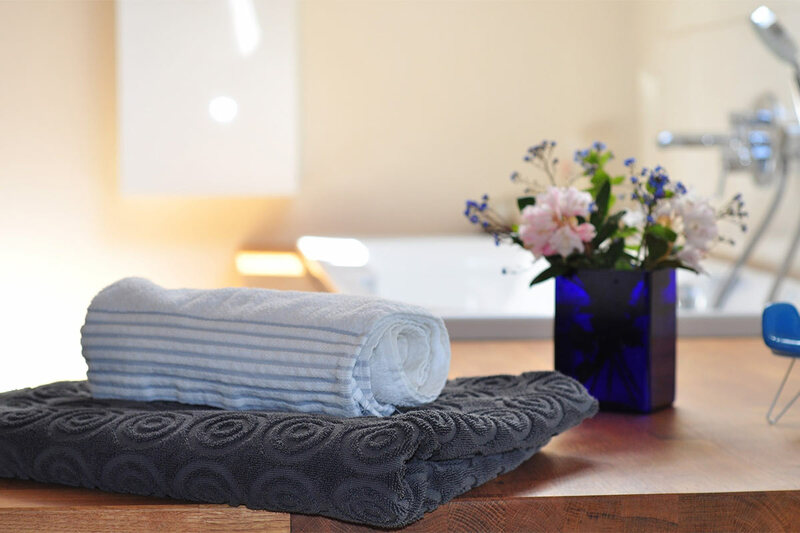 Inferior towels and bathrobes will not allow you to enjoy your baths to the fullest, so if you’re going to spend on bath-related luxuries, let it be on towels and bathrobes. In particular, check how high the fabric’s pile is—i.e. its raised surface or nap. The higher the pile, the softer is the fabric. While you might think that drinking wine or champagne from a traditional tall glass while you’re in the bath is romantic, it’s probably not the safest thing to do, especially if you are bathing alone. You could end up breaking the glass and cutting yourself, or you could pass out from your drinking and end up submerging yourself in the bathtub. Not a good thing! Make things safer by choosing a non-alcoholic sparkling beverage instead. You can also buy an unbreakable polycarbonate tall glass to simulate the experience of drinking from a real champagne glass without the danger of breaking it. With these easy tips, you’ll be well on your way to making your time in the bathroom more remarkable indeed. How about you? What other tips do you have in mind?